The coffee scene in Brussels has been gradually expanding over the last decade and I was a patient observer for part of it while living and working in the Belgian capital for 3 years. The beginnings can be traced back to when OR COFFEE opened the first specialty coffee shop in the center of Brussels. OR COFFEE were forerunners of specialty coffee in Belgium, together with Caffénation from Antwerp, and have certainly had a great impact on how the coffee scene developed in the years after they first made an appearance in Brussels. Since then, a new coffee star appears on the horizon roughly every two years or so and I keep coming back to Brussels to visit favourites and newcomers. Here’s an introduction to my go-to places for specialty coffee in Brussels. From the student city Leuven to one of the bustling quarters of Brussels, MOK has had quite a journey in the 4 years of its existence. In 2012 the founder Jens Crabbé scraped all of his savings together to open a specialty coffee bar & micro roastery in Leuven that would soon become an integral part of Belgium's third wave movement. In September 2016 he ventured into the capital to find MOK a second home in Rue Antoine Dansaert. And Jens isn't going to stop here: while constantly striving for excellence his goals are constantly taking on different shapes. While he grew up, so did his ideas. "I want people to line up outside of our Brussels shop for our coffee!" he tells me with a hint of pride and confidence. And proud he can be, the Brussels space is unlike anything I have ever seen in the city! The credo 'less is more' definitely applies here. as clean design meets clever ideas. The seating area by the big window at the entrance is arranged in a way that dissolves physical boundaries. The same goes for the bar: there isn't a counter in the classical sense and the barista is brewing coffee around a communal space in the middle of the room. This set-up encourages exchange and mingling, something that you don't see everyday in Belgium. For the hungry ones the back room hosts an open kitchen completely in white with plants hanging from the wall. For now, the roasting is still done in Leuven by Jens himself in the same spirit as before: coffee beans are carefully selected from particular coffee farms and lots, roasts are light and rotate every couple of weeks according to harvesting seasons. 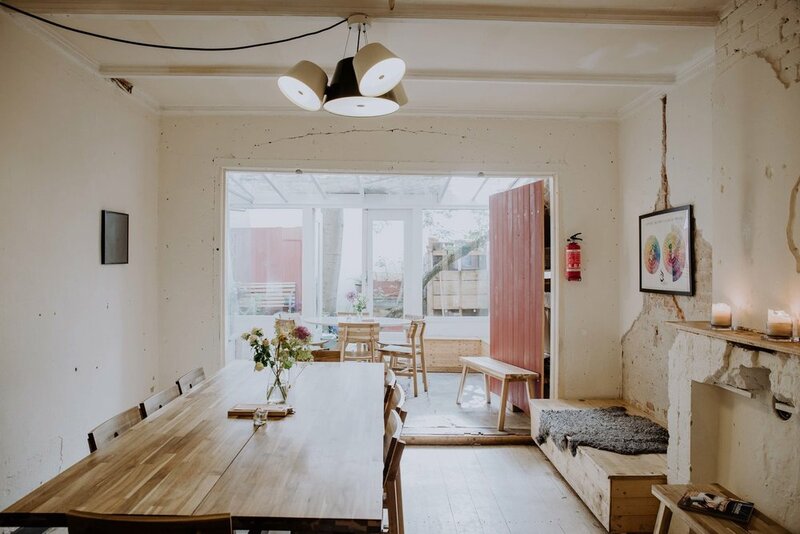 The future is looking bright for MOK, as the little white packages make their way through Europe`s finest coffee shops, with Oslo Kaffeebar in Berlin being one of the latest ones to adopt MOK into their repertoir. Since 2012 Parlor Coffee is at home in uptown Brussels and shortly after the cafe was opened I've started to be a regular customer here. So it was about time I wrote about one of my favourite coffee places in Brussels, conveniently located in the area of Chatelain, St. Gilles and Louise and luckily for me only a 5 minute walk from my house. Hardly a day passes by that you won't be welcomed by both Bram and Yumi, partners in crime on a mission to bring high quality, freshly roasted coffee to residents and visitors of Brussels alike. The interior is simple, a barefoot walk on wooden floors paired with a subtle industrial feel created by the lighting hanging from the ceiling. The pale walls are decorated with changing photographs. On Tuesday afternoons, Bram gets busy on the Probat roasting machine standing in the back room to roast the latest beans sourced from a Norwegian supplier that works with small-scale producers who care about the quality, working conditions and sustainablity. The coffee at Parlor has proven to be consistently excellent over the past few years as they pay great attention to detail. Whether you're after filter or espresso, there are different origins the grinders. If you are looking for that familiar place where you can unwind with a good cup of coffee you should pay My Little Cup a visit. It is a tiny corner shop that opened March 2014 in a quiet area of Brussels, not far from the center and around the corner of Parc Royal. The shop front marries clear branding with hints of characteristic Bruxelloise art nouveau architecture and the floor-to-ceiling windows make for a plenty of light. After experimenting with a number of roasters, also local ones, My Little Cup stayed loyal to Belleville, a micro roastery from Paris, for a few years. Recently they started working with other roasters as well. By the way - if you're in Canada you're in luck, co-owner Laurent tells me there is a My Little Cup in Montreal as well. After a period of stagnation, 2016 marked the year that new specialty coffee shops finally appeared on the Brussels coffee map. Belga & Co became part of that expansion when two friends, Loïc and Charly, opened the first specialty café in the Châtelain neighbourhood. They have since ventured into Saint-Boniface with a second coffee shop and word has it that a third one is planned to open in Antwerp. As Belga & Co roasts their own coffee, it comes in handy that Loïc used to work for a coffee trading company. Their espresso blend contains premium commercial grade coffee but all single origins, for both espresso and filter, are specialty grade. Their approach is to focus on taste rather than points when selecting the beans. "We seek to highlight the sweetness in the cup", says Loïc, which is why their roasts are on the medium side. "We used to roast lighter but decided to adapt to what our guests like". Expect a balanced cup for espresso and choose from Kalita, Aeropress, Chemex or french press for filter.